A rosary and mass are scheduled for 9 a.m. Saturday, Nov. 7, at Our Lady of Grace Catholic Church for Julia De La Rosa of Artesia. De La Rosa, 83, passed away Wednesday, Nov. 4, 2015, at San Pedro Nursing Center. Fr. Martin Cornejo will officiate at the services, with interment to follow at Woodbine Cemetery. Pallbearers will be Jacob Aguilar, Gucci Lopez, Luchiahno Lopez, Mauricio Jacobo, Aaron Hinojos and RJ Martinez. Honorary pallbearer is Jarred Aguilar. Visitation began at 10 a.m. today at Terpening & Son Mortuary. De La Rosa was born Jan. 28, 1932, in Wheatland, Wyo., the daughter of Marcelo Baeza and Petra (Rodriquez) Baeza. 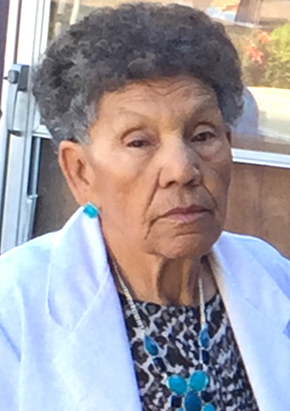 She was a lifelong Artesia resident. On Oct. 12, 1947, she married Andres De La Rosa in Carlsbad. She was a housewife and member of Our Lady of Grace Catholic Church and the Moose Lodge. Survivors include daughters Carol Aguilar and husband Stephen, Terry Lopez and husband Mario, and Tina Huerta and husband Nat, all of Artesia, and Carmen Hinojos and husband Domingo of Hobbs; brothers Ysidro Baeza, Manuel Baeza and Louis Baeza, all of California, and Robert Baeza of Artesia; sisters Juanita Renteria, Margaret Rodriguez, Ramona Rodriguez, Connie Olivares, Elfida Moreno and Ofelia Solis, all of California; grandchildren Jennifer Florez, Jacob Aguilar, Jarred Aguilar, Rosemary and Mauricio Jacobo, Junior and Bonnie Hinojos, Joann and Amador Rodriguez, Gucci and Angleica Lopez, Luchiahno Lopez, Shanisse Huerta, and Dominic Marquez; 12 great-grandchildren; four great-great-grandchildren; and numerous nieces, nephews and “adopted” grandchildren. She was preceded in death by her husband, Andres De La Rosa, on May 6, 1995; her parents; and a brother, Fidel Baeza.